Originally published under the title," No Jihad in Gaza, Says George Washington U's Nathan Brown." Though Palestinians "sometimes ... don't make the choices that international diplomacy would like them to make," says MESA President Nathan Brown, the world must accept Hamas as "a legitimate political player." Current Middle East Studies Association (MESA) president and George Washington University political science professor Nathan Brown downplayed Hamas's long history of terrorism on July 23 at the anti-Israel Jerusalem Fund think tank in Washington, DC. He and others on a panel titled "Gaza in Context: Broader Implications in the Palestinian Plight" claimed that the Islamic supremacism of Hamas and, increasingly, the Palestinian Authority (PA) is mere nationalism before an audience of forty. Former Jerusalem Fund and current U.S. Campaign to End the Israeli Occupation director Yousef Munayyer opened the panel with a proclamation worthy of the Gaza Chamber of Commerce: "Gaza can be a hub of commerce and industry" with "tremendous potential to once again be an engine of success and prosperity." Yet the Gaza strip became a threat to Israel after it relinquished the area in 2005 to Palestinians who were more interested in ransacking and militarizing donated Israeli greenhouses than engaging in commerce. Noting that Gaza, with 1.8 million inhabitants, is the largest Palestinian city, Munayyer asserted that the "most valuable resource to the Palestinian nation is perhaps its population," a claim belied by Hamas's frequent use of such "resources" as human shields for propaganda against Israel. Brown and many other academics see Hamas as just another national movement struggling against oppression. In his presentation, Brown observed blandly that Palestinians "sometimes . . . don't make the choices that international diplomacy would like them to make," as if Hamas was simply a political party. Palestinian self-determination is something the "international community has heartily endorsed, so long as Palestinians make the right choices," he added. Without naming either perpetrator or victim, Brown vaguely referred to "episodic violence" involving Gaza. He cited a Palestinian Hamas supporter who, in reference to Israel's 2014 Protective Edge military campaign in Gaza, wondered, "what would have happened if Hamas had given up arms," implying that Hamas was merely defending itself. Brown sought a "reconstruction of Palestinian politics" that might create "fresh Palestinian leadership" who could resume a peace process with Israel. This Palestinian "new blood" would "sketch out realistic programs to their own people" and "rebuild some kind of grassroots popular movement," he predicted. He could not cite any period when Palestinians have ever had responsible, democratic leadership, but instead called for the "unfreezing of the really problematic authoritarian environment in both the West Bank and Gaza." As for accepting "Hamas as a legitimate political player within Palestinian society, both domestically and internationally," Brown insisted that, although a large "stumbling block," it would induce Hamas to relinquish power in Gaza. Stating the obvious, he admitted that Hamas is not interested in the "idea of administering Gaza" as a "governing municipal authority." In contrast, Brown accused Israel of trying "to keep tight control" on the "freeing of Palestinian political life." Yet Israel abandoned control over most daily Palestinian affairs under the 1993 Oslo Accords. The eagerness of both panelists to legitimize Hamas became even more obvious during the question and answer period. 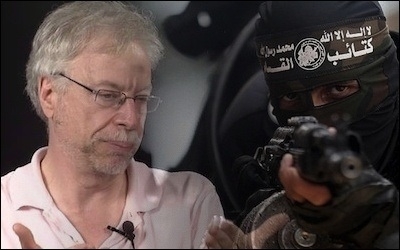 When asked by an audience member whether the U.S. could "stop branding Hamas as an international sponsor of terrorism," Munayyer responded that, although he did not "see that happening in the near term," American policy has long sought a "negotiated solution with leaders who do not have the mandate to deliver." To be "seriously for a negotiated solution . . . one cannot be seen as credible if not working for a representative and unified Palestinian partner," which, for Munayyer, includes Hamas jihadists. Yet, he alleged, "pro-Israel interest groups" and "domestic political interests get in the way of advancing foreign policy." Such is the Jerusalem Fund's alternative universe in which neither Hamas, the PA, nor a "unity government" presents any existential threat to Israel or the wider world. Political scientists such as Brown see Palestinians as just another national self-determination movement struggling against oppression. This willful moral and intellectual myopia denies the Palestinians' embrace of Islamic supremacism—a fact that precludes their acceptance of Israel's existence. Andrew E. Harrod (@AEHarrod) is a fellow with the Lawfare Project. He wrote this essay for Campus Watch, a project of the Middle East Forum.